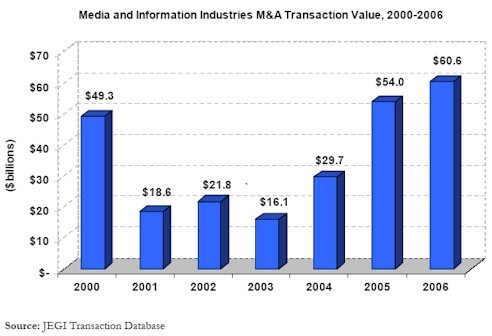 M&A activity in media and information industries flourished in 2006 with 637 transactions valued at more than $60 billion, according to The Jordan, Edmiston Group, Inc. (JEGI), the New York-based investment banking firm that specializes in media and information. Led by growing consolidation in the Marketing & Interactive Services and Online Media sectors and aggressive private equity activity, 2006 smashed the 2005 records by 18% in deal activity and 12% in total deal value. VNU purchase by private equity group for $11 billion was the largest deal in 2006. Online media (activity up 55%). Note: The $11 billion purchase price of VNU has been allocated (based on revenue growth generated by each division) across the following sectors: business magazines; exhibitions and conferences; and marketing & interactive services.